Today's post is really exciting because I get to debut my T-SHIRT QUILT! I LOVE, LOVE, LOVE IT soooooooo much!! For those of you who've been to college or are in college, you know that you get a ton of free t-shirts. Well, mine had been taking up quite a bit of room in my suitcases (as I've been moving a lot in the last couple of months), so I decided to consolidate. I kept the ones I actually wear, donated the ones I don't like, and used the rest to make a t-shirt quilt. 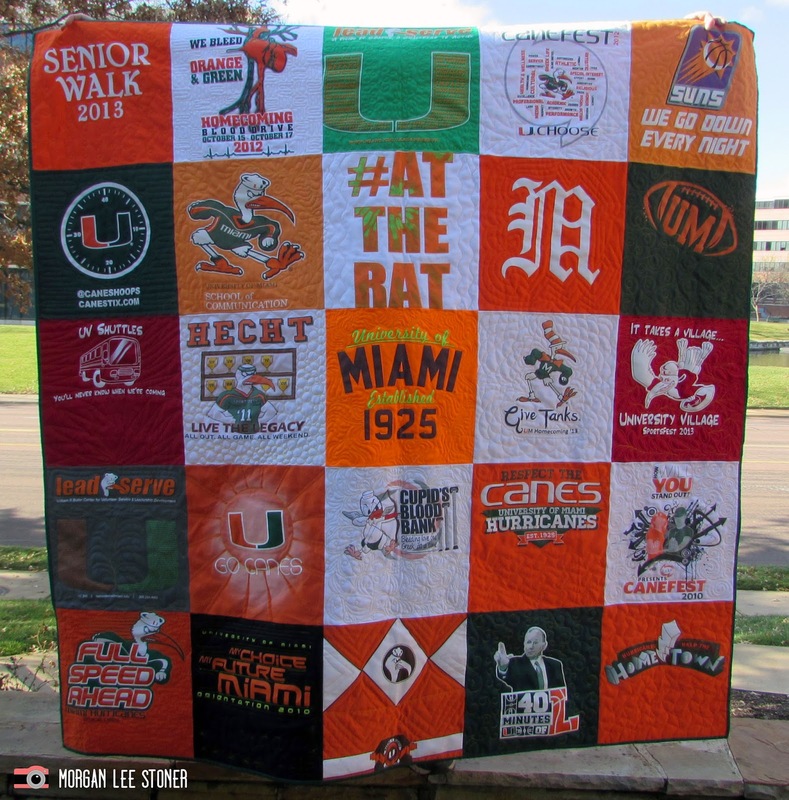 There are companies that make your t-shirts into a quilt for you (for ~100-200 dollars) but I have a very crafty grandmother who I commissioned to do it for me (with my help, of course). Disclaimer from my grandmother: "Don't tell anyone I made you this quilt, because I am NOT doing it again." Haha, thanks grandma. I guess it was quite the long process. I won't go into the tedious details of the quilt making process, but here's an overview. In the past month or so since my job ended and I moved back home to St. Louis, I think I’ve slowly begun to lose my mind. I crave organization. I always have, even as a young girl, but as of late, it has gone to extremes. I keep my calendar and planner with me at all times just to make sure I’m not missing anything. I double and triple check my to-do list, Peace Corps paperwork, and packing list. I go through my emails everyday to make sure I’ve completed all my Peace Corps tasks and responded to any and all emails. I complete all my assignments weeks in advance, and then wonder when the next assignment will come. Basically, I need O.A. (Organization-ers Anonymous). I find myself painting my nails for the pure pleasure of making them look perfect, and then an hour later, wishing I could take off the polish so I can paint them again. But that’s ridiculous… right? Since I am choosing to leave the country for 2+ years and live/work in a foreign country, many people assume that I studied abroad in college, or had similar international experiences, which spurred my desire to join the Peace Corps. Although I have traveled quite a bit, I never studied abroad. I come from an affluent suburb of St. Louis and I attended a top 50 university, which means many of my peers took advantage of study abroad opportunities, and it was assumed I would too. Honestly, until my Junior year of college, that was my plan.